PF Champion Script Pro can be referred to as the most advanced and dynamic calligraphic family ever designed. The Modern Cyrillic 2009, a Type Design from the International Type Design Competition held in Moscow honoured this typeface for Excellence. It also received another laurel from Granshan Awards 2010, the 3rd International Eastern Type Design Competition. The lettering is based principally on the manuscripts of the 18th century English calligrapher Joseph Champion. 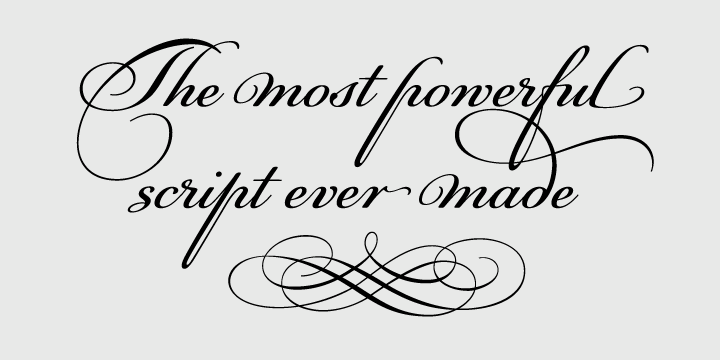 It was developed over a period of two and a half years, each one of the 2 weights is loaded with 4300 glyphs. The PF Champion Script Pro font supports all European languages based on the Latin, Greek and Cyrillic scripts.